There are many ways to look at this print. One way it can be viewed as a visual joke with two famous actors in the roles of two of the Seven Propitious Gods. The humorous intent is unmistakable. The other prints in this series have similar pairings of folk legends. 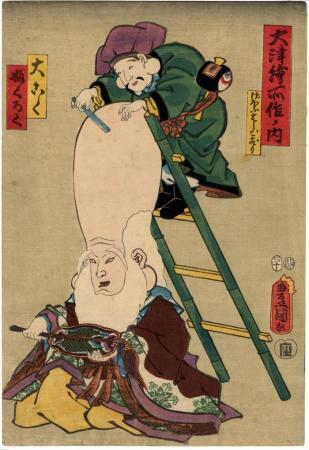 These would have easily tickled the funny bones of Kunisada's contemporaries. For example, one shows a famous onnagata as the Wisteria Maiden watching another actor portrayed as a monkey clubbing a giant catfish. All composed of typical Ōtsue-e figures.